(Nanowerk News) Elmarco introduces the updated Nanospider™ (“NS”) LAB – the first product update to the world’s best-selling nanofiber research tool which was originally launched in 2005 at the Nanotech exhibition in Tokyo, Japan. Designed for experimental work on nanofiber material and applications, this new product incorporates years of customer feedback and product support. With a smaller footprint and lower cost, the NS LAB now makes use of the stationary wire electrode first introduced into Elmarco’s industrial lines in 2010. All Elmarco products, from the 1.6 meter wide working width NS 8S1600U to the NS LAB launched today, now incorporate the stationary wire electrode system. This system is often referred to as Elmarco’s “Gen2“ technology, as opposed to the original solid metal electrode, which is considered “Gen1”. This electrode method has consistently demonstrated (i) high throughput, (ii) excellent uniformity, (iii) flexibility in working with multiple polymer systems, and (iv) stable operating performance in production settings. “When we introduced the NS 1WS500U two years ago, it quickly became our best selling product; but at its higher price point, it is really intended for industrial R&D centers – we know how price sensitive the academic market is,” said Elmarco’s CTO Aleš Gardián. The NS LAB was designed to enable basic materials science exploration such as nanofiber membrane process parameters, fiber spinning conditions, composite performance, and new material development. The device is equipped with precise control of substrate speed for thick nanofiber layer preparation that makes this tool ideal for exploratory research in membrane, air filtration, liquid filtration, medical, and many other areas. “Nanofiber membranes are used as part of a composite to develop high performance membranes – with this tool we’re making it easier and more affordable for universities and other academic institutions to develop solutions in these areas,” said Aleš Gardián. “With this new product, Elmarco strengthens its position as the global leader in not just industrial equipment but also academic research equipment designed for the needs of universities and research institutes. Asia has been and will continue to be an important market for Elmarco, which is why we chose to unveil the product here at Nanotech 2014 in Tokyo,” said Kaz Nomoto. Nanospider™ technology is a patented needle-free electrospinning process for the industrial production of nanofibers. 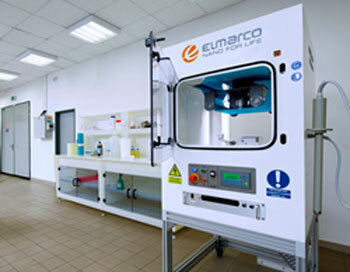 The technology uses simply shaped electrodes covered by a thin film of a polymer solution that enables Elmarco to build industrial equipment with simply serviced parts, i.e. without nozzles, needles, or spinnerets. Nanospider™ technology delivers nanofiber material in high volumes, together with outstanding fiber diameter and web uniformity. With over 130 field installations, Nanospider™ technology is the world leader in high performance nanofiber membrane production. Elmarco works with world leaders in filtration and advanced membranes using the company’s pioneering industrial-scale nanofiber production equipment. Elmarco's unique Nanospider™ technology is designed for ease of use, scalability, modularity, and flexibility in producing the highest quality nanofiber membranes. The global headquarters is found in Liberec, Czech Republic, with two sales and services offices in Morrisville, NC, USA, and in Tokyo, Japan. Elmarco employs over 80 people worldwide, including 35 R&D specialists.